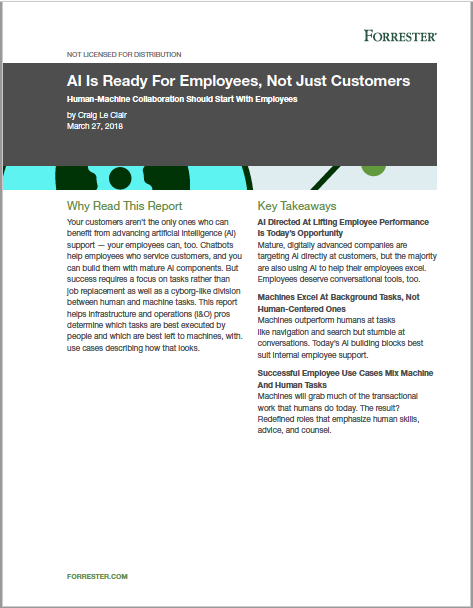 Your customers aren't the only ones who can benefit from advancing artificial intelligence (AI) support — your employees can, too. Chatbots help employees who service customers, and you can build them with mature AI components. But success requires a focus on tasks rather than job replacement as well as a cyborg-like division between human and machine tasks. This report helps infrastructure and operations (I&O) pros determine which tasks are best executed by people and which are best left to machines, with use cases describing how that looks. Copyright © 2018 LogMeIn, Inc. All rights reserved.